It seems every day you hear about a new credit card. Every theater and grocery store has one on display and they are all competing for new customers with varied points, rewards and amenities. So where do you start? Our list of best credit cards in the USA ranks shows the best-ranked cards in 0% balance transfers, rewards, cash back or hotel & airline bonuses. 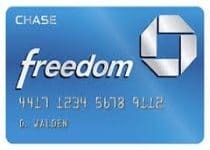 Issued by JP Morgan Chase, the Chase Freedom credit card offers 5% cash back on combined purchases up to $1,500 each quarter. This saves a good chunk of change if you plan on spending in advance. Switching from restaurants to gas stations to online suppliers, these 5% categories change every three months, so you won’t always be stuck spending money at the same locations or on the same products to get your money. Chase Freedom also currently offers one of the largest sign up bonuses in the market by offering a $100 bonus after spending only $500.